Reports of sinking ships swallowed up in a sea of fire near Odo Island attracts the attention of a Japanese research team. Sent to investigate, the group led by Dr. Yamane find high levels of radioactivity and the shocking discovery of a gigantic prehistoric monster the islanders call 'Gojira'. 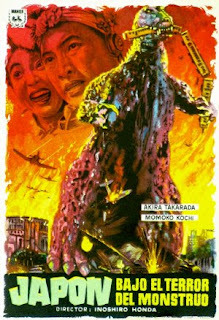 The enormous creature makes its way to Japan and tramples cities under foot while scorching both buildings and escaping civilians with its radioactive flame. Dr. Serizawa, a reclusive scientist, has developed a weapon even more terrifying than the rampaging Gojira--the Oxygen Destroyer. Beseeched by others to use the devastating weapon against the monster, Serizawa must make a decision that will either save, or possibly destroy the planet as we know it. Relatively few science fiction, or monster movies are as viscerally potent, or as dishearteningly symbolic as Ishiro Honda's original and unabridged version of GOJIRA (1954), or GODZILLA as it's more popularly recognized around the world. The film was a brutally powerful piece of filmmaking back then and resonates an eerie aura today considering Japan's recent, and increasingly dangerous situation from possible contamination from nuclear exposure. Japan is the only country on the planet to experience the horror of atomic devastation and from that, they are the only country that could understand and respect such annihilation and the even more crippling aftermath. If ever there was a significantly effective science fiction film masked as an anti war statement, its GOJIRA. The script (to which Ishiro Honda contributed) touches on this grueling subject matter in a profoundly grim fashion and in a way no other monster movie had ever done before, nor since. Outside of Godzilla as a metaphorically massive representation of atomic destruction, the film has several gut punchingly powerful sequences that alternate between somber poignancy and tear inducing tragedy. A crying woman clutches her three trembling children close to her amidst burning constructs. She proclaims they will soon be with their father just as Godzilla sends them on their way. Another sequence of virulent resonance follows Godzilla's destructive swath through Tokyo as the city is flattened within minutes. Serizawa, having refused the notion of using his Oxygen Destroyer against the towering titan, witnesses on television radiation scarred dead and dying backed by "A Prayer For Peace", a song of hope echoed with deep solemnity from a children's church choir. Realizing he has lost his future wife to another man, Serizawa decides there is nothing left but to make the ultimate sacrifice to save civilization. Honda's humanistic and erudite monster movie is not only dominated by an impenetrable sense of death and despair, but it's also imbued with an undeniably strong sense of hope and life. An unusual precedent is set that rarely ever turned up again, and never captured as dramatically as it is here--the human drama is just as integral to the plot as the monster sequences and Honda treats both on an equally serious level. This is seared into the viewers psyche by the poundingly ominous, occasionally majestic and melodically gloomy score by Akira Ifukube. Without it, Honda's movie would likely be a far less evocative endeavor. In another stroke of genius, fear is foreshadowed by the loud thrum of Godzilla's deafening footfalls moments before he makes his frightening appearances. Steven Spielberg was likely inspired by Honda's film as he did roughly the same thing in JAWS (1975) by use of John Williams classically terrifying main theme. He displayed an even more obvious homage in JURASSIC PARK (1993) with the sonic reverberations of the Tyrannosaurus Rex announcing its arrival. It took nearly a decade after both Hiroshima and Nagasaki were destroyed before the mighty footsteps of Godzilla were felt by audiences. Even then, a little movie called THE BEAST FROM 20,000 FATHOMS (1953) helped pave the way for Japan's future box office champion and the many sequels and spin offs that followed in his radioactive wake. The US version (retitled GODZILLA, KING OF THE MONSTERS) was released in 1956 minus approximately 20 minutes of footage and new scenes with Raymond Burr edited in. In an unusually respectable touch, the US distributors created a near seamless amalgamation that, while not as strong a movie as the original version, is still an interesting edit in its own right. GODZILLA (in its original version) is arguably one of the finest, most personable motion pictures ever made regardless of the popular, yet derogatory stigma attached to Japanese science fiction films. There has yet to be another monster movie from anywhere in the world as effectively mounted as this one in its serious approach to an all too real threat. Ishiro Honda's brutal masterpiece isn't just about a creature rising from the sea to destroy world cities--it's a timeless cinematic decree of possible human extermination and an allegory about the potential for nuclear holocaust born out of the folly of man--an animal prone to destroy just as easily as he may create.